Muhammara is one of the most popular mezze dishes and one of the most distinct flavoured. This dish is originally from Aleppo, they love their peppers there. Even a type of pepper is named after the place Aleppo Pepper. 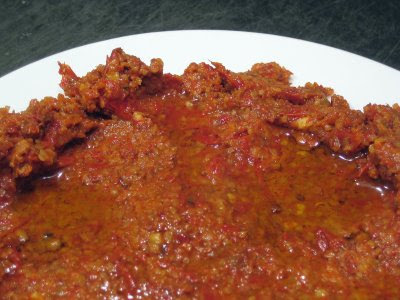 The main ingredient in Muhammara is sun-dried pepper paste. The red pepper is finely chopped, salted and dried in the summer sun in large trays. You buy red pepper paste ready made from the market in Syria as it is a long painful process to make your own as I personally discovered. Here in London if you depend on the beautiful British summer to dry your peppers you are up for a long wait. The Olympic will hit London way before you get to taste your Muhammara. Instead I tried a Nigella Lawson inspired "Oven Kissed" red pepper paste complete with finger licking and night trips to the fridge. I heated the oven to maximum, cut my red peppers to half, salted them and put them in the hot oven. I immediately turned off the oven and left them over night. Next morning, no where near ready! I repeated the process and by the evening, after the oven cooled down again, I thought they are ready enough. NOT REALLY. I put the peppers in the food processor and so much water came out. I had to spread them on a tray and back to the hot oven for another night. They came out OK this time. Close enough to the real thing. The moral of the story, If you are in Syria go to the market. If you are in London buy a jar of ready roasted peppers and put them in the food processor. Update 4/11/2009: I now managed to find Turkish made red pepper paste from a Turkish supermarket in West Ealing. I am sure you can find it as well in the many Turkish shops in North East London, Green Lanes area. Check my Essential Shopping Basket for more details. This recipe is how my mum make it rather than the traditional way. I use fine bulgur wheat instead of the usual bread crumbs. Bulgur wheat from Arabic supermarket comes in two varieties coarse for cooking and fine for tabouleh and kebbeh. The one you buy from Tesco is somewhere in between and it doesn't work for either purpose. So make a trip to the nearest Middle Eastern shop, it is worth it. Mix the pepper, Bulgur(bread crumbs), walnuts and the molasses and mix well. Add lemon to taste. You might need to add some sugar if your peppers are not sweet. Muhammara is nice with a sweet hint. Finally add olive oil slowly and mix till you get the right texture. There is loads of variations to this recipe and you can experiment. I add a table spoon or two of tahini. I think it works very well. Garlic and cumin are common ingredients to add. And finally hot chilli powder if you want it hot. You eat it like a dip (well, you scope it with Arabic or pitta bread). Alternatively make Muhammara without Bulgur or bread crumbs, open pitta bread in halfs, spread the muhammara and put under the grill for a couple of minutes. Best snak ever!! I just discovered your blog. Very witty and interesting to read. Thanks! Also, I have seen recipes for muhammara that use 3 types of nuts and fry them first..Ah! now, I am confused! Hi there and welcome to my blog. Thanks for the nice words. I just checked your blog, nice work. Great to see blogs dedicated to Arabic food. Regarding muhammara, like all other mezze there is no right or wrong. Everyone has their own recipe. I assume the nuts are walnuts, pine nuts, ... but what is the third one? I adore this! I discovered Muhammara when I fist arrived in Saudi Arabia years ago. I buy it from this restaurant - run by Syrians! - but I've never attempted to make it myself. Now I have a recipe to fall back on when I leave Saudi. You should try to make it. It will taste different for sure but as good, I hope. Muhammara is one of the dishes that never taste the same in different restaurants or using different recipes. An easy way to roast the peppers is to put them directly onto the gas flame on the stove top. They blacken very quickly and you can then add them to a bowl with clingfilm on top and the skins come off really easily. Thanks for the tip. I use this technique with aubergines to make Baba Ghanoush and Mutabal. For Muhammara I was trying to recreate the sun-dried peppers paste you buy in Syria. Roast peppers work for this recipe but not to the same extent. Woow 50 people! That is some big meal you are cooking. Are you cooking a breakfast or dinner? What are planning to do with artichokes? are they whole baby artichoke or Syrian-style hearts only? Regarding quantities, I never cooked to any more than 10 people, but I think you need to multiply the quantities in my mezze recipes five folds. I think you should offer some salad, Fatoush is your ideal option as tabouleh will take ages to chop parsley for 50 people. Another thing I can suggest that is easy to make and feed loads of people is cheese borek (filo pastry rolls with a stuffing of white cheese, parsley, salt and black pepper) you can make them in advance and freeze them then on the day brush with butter and bake in the oven. Interesting. Burghul instead of bread crumbs. Forgive me, but there is nothing that irritates me more than Bulgur, the way the Armenians pronounce Burghul. I guess they introduced it to the West so Bulgur stuck. I wish those who know though would use Burghul. Some well known cook book authors do. Re--Muhammara, while I have not tried it with burghul, we use walnuts sometimes, 100%, and sometimes mixed with bread crumbs. It is excellent either way. I appreciate what you said about Bulgar vs. Burghul but this blog is not directed at Syrians or Arabs only. I hope that it will attract a good non-Arabic speaking readership. For the benefit of those people I decided to use Wikipedia spelling whenever I can. So if somebody is not familiar with an ingredient they can google it and it comes on top of the page. I realize this is an older entry, but I'd love to have some info - I have been making this from recipes on the net and one is never sure what is authentic. The red pepper paste you descripe sounds very dry, but the jarred peppers are not at all dry. How can they be substitutes? I've been roasting the peppers over fire and peeling them. The result tastes good to everyone, but no Syrians have been at the table so maybe it is way off. The hot pepper isn't an essential part of the dish? I had never heard of the dish and came upon a recipe by chance -- pure senendipity. There is rarely a middle eastern dish we don't like and this was no exception. I'll have to go through your other posts. Authentic muhamara is a fairly dry spread, much thicker in consistancy than hummus. 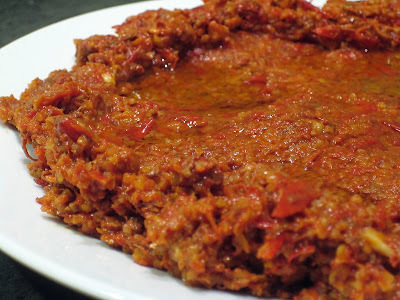 To get authentic muhammara you need the "dry" red pepper paste that why I tried to slowly dry the peppers in the oven to get most of moisture out. But if you mix the dry pepper paste and bread crumbs you will end up with very dry mix. You will need fairly generous amount of loive oil or even some water to loosen it up to the right consistancy. If you use jar peppers you will not need as much extra moisture. Hot peppers are optinal, in Aleppo muhammara will be hotter than that of Damascus. This a variation on the recipe like using cumin or garlic or tahini to add an extra flavour. Hope this has answered your question. please let me know if you want to know more. I have another question, now spring is finally setting in, I'd fancy a fresh limon bi nanah! But I haven't discovered a recipe yet, do you happen to know of any? Welcome to my blog. I am glad you like it. As I mentioned before you need a generous amount of olive oil and possibly some water to get it right. If the flavour is not the same as the one you tried in Damascus, the most likely cause is the red pepper paste. The one you get in Syria is strong flavoured and quite sweet. So try to re-create that by adding sugar or more pomegranate molasses. I like to add a spoon or two of tahini and it works very well for me. Lemon bi Nanah recipe is on its way, I promise! How many red peppers would I need to make 250g of red pepper paste? Welcome to my blog and sorry for the late reply. Not sure exactly but I would thought you need 500g to start with. Hi Kano, this recipe looks absolutely amazing! I think the best I ever had was in the restaurant called Old Town, somewhere in Bab Touma, although I would agree with you that Naranj was probably the finest of the eateries in the Old City. I loved Al Khawali though, mainly because of the bread and the atmosphere, and there was an amazing little place I used to frequent called Al-Shamiat somewhere in the New City which was perfection. I actually found a restaurant in London serving muhammara the other day which I reviewed (http://sugarstreetreview.com/food/restaurants/kaslik/). Would love to know if you have any recommendations of places to go! I could probably eat myself to death w this one! Try doing them in a dehydrator next time. the heat cooks them without moisture. this is an old family fav of ours. only thing we do different is we add finely diced raw onion. adds another texture and detention. over time they get pickled in the sauces. I though about the dehydrator but unfortunately I don't have one. Yes and I have left you a reply. I would love to take part. Would you kindly email me so we can discuss details. Granddad, May Your Soul Rest in Peace.